This is going to be quite the week for animation fans. Later in the week, we are due the first trailers for How To Train Your Dragon: The Hidden World and The Lego Movie: The Second Part. Before that though, the second trailer has arrived for Ralph Breaks The Internet: Wreck It Ralph 2. The initial teaser trailer introduced us to the sequel's basic concept- that Ralph and Vanellope will leave the Arcade for the wider world of the Internet. The new trailer spends virtually all its time showing off the film's unique version of cyberspace, while still keeping much of the plot under wraps. While the first film was full of references and gags from the gaming world, the sequel will do the same for the online world. The trailer is also full of appearances from other Disney owned properties. There's blink-and-you'll-miss-it appearances from The Muppets, Dumbo and Marvel characters, plus more prominent appearances from Star Wars Stormtroopers and Eeyore. We also get our first look at the new character of Yesss, voiced by Taraji P Henson. 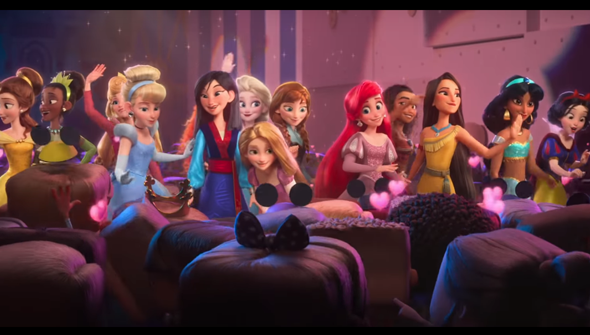 The part of the trailer that has everyone talking, however, is the appearance of the Disney Princesses. As revealed last year at D23, their original voice actors have returned to reprise their roles (as far as possible). Ever since that footage was shown to lucky attendees, we've been eager to see how the scene would turn out. Based on what we see here, not only do they all look fantastic (having had a redesign to make them all fit Ralph's world) but their sequence seems to be much more than just a throwaway gag. Ralph Breaks The Internet: Wreck It Ralph 2 will come to cinemas in the US on November 21 and in the UK on November 30.